ItemMS-3100.5.35 - Emery Bar [Emory Bar] & The Cascade range of mountains. Fraser River. British Columbia. ItemMS-3100.5.38 - An unstable and dangerous part of the road. Consider the temporary supports for heavy freight loads. Shameful Mr. Contractor. A view on the Fraser River wagon road at the 17 mile post. British Columbia. ItemMS-3100.5.40 - Chapman's Bar Bluff blasted by the Royal Engineers. 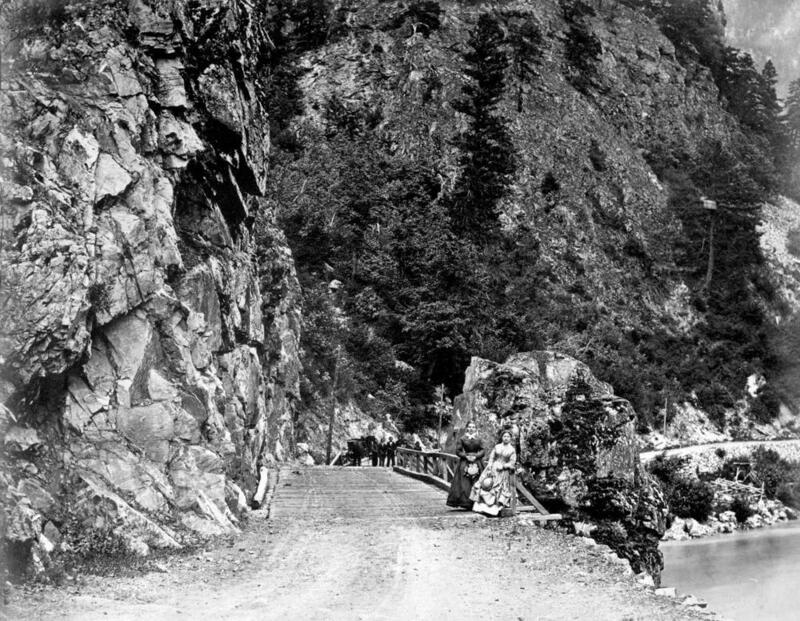 Fraser River wagon road. British Columbia. ItemMS-3100.5.42 - The waterfall on the Thompson river at Cooks [Cook's Ferry] ferry. Brit. Columbia. ItemMS-3100.5.44 - At this point I had to take two views as a rattler happened to be under the stone that I rested my plate against to dry it in the sun, and licked the water off marking the plate from the top to the bottom with its forked tongue. [Dally also drew a picture of the snake's tongue markings in the margin]. Thompson River wagon road scenery at the little bluff 80 [1/2?] miles above Yale. Standing at side of road along river. MS-3100, Album 5, Page 37. Horse and trap visible at the end of the bridge.